You cannot create unity from disunity. “Kind begets kind,” as the King James Bible tells us. What goes in will come out. If disunity is what is in your marriage, disunity is what will come out of it. What we are as parents is what we are going to export to our children. If disunity primarily characterizes your marriage, the likelihood of your children being relationally dysfunctional is high. This truth of “kind produces kind” tempts me to say to some parents who are anxious about how their children are doing is to stop parenting and start working on their marriages. The most powerful, impressive, and effective gift that parents can give to their children is a warm, unified, and happy marriage. Think about it this way. What if there was division in the Trinity? What if the Father, Son, and Spirit were angry with each other, or did not want to be around each other? If that were true, we would not stand a chance of turning out okay. One of the most significant characteristics of the Trinity is their togetherness. We do not have to worry about whether the Godhead is going to stay together or if they are going to get into a yelling match. Have you ever worried that way about the Trinity? I suspect it has never crossed your mind, or if it did, it was a fleeting thought that you immediately shrugged off as impossible. God’s children do not fret over a lack of stability in the Godhead, and our children should not have to worry about the instability of their parents. Parents should not put that kind of burden on them. When children think about their parent’s marriage, they ought to immediately think about love, joy, peace, patience, kindness, and the four other manifestations of the fruit of the Spirit (Galatians 5:22-23). If these children are more aware of the hostility, unforgiveness, and general disunity in their parent’s marriage, their hearts will be motivated to gravitate toward other things outside their home that they perceive to be more stable and secure. This temptation will lure them to want to leave their homes prematurely. Everybody wants security; nobody likes instability. When I was an early teen, because my home was dysfunctional, I sought stability through my ability to perform well at my job. My work gave me the things that I craved from my parents, things that they would not give me because of their unwillingness to love each other well. Security, approval, acceptance, and a sense of accomplishment were mine as long as I could perform well on my job. And I did. My work was a place of refuge. My home was a chaotic context for disunity that I could not control, but I could manage things on my job through my self-sufficient work ethic. Home life was something to endure, while my work life was a pleasurable escape. This course of action is natural for teenagers who live in chaotic homes. Their hearts begin to drift from something they can’t control (family) to something they can control, which will always connect to their strengths. Here are a few of the most common escapes that are waiting to capture the hearts of our teenagers. Social Media – Social constructs provide what appears to be safe, risk-free environments to find acceptance. For example, manipulating likes through your social media efforts is an obvious replacement to the lack of love in the home. Abilities – A teen may feel the need to be good at something, especially when their home life is such a downer. If you live in a 24/7 insecure home, never knowing what is going to happen next, finding security through your God-given gifting can be a “nice fix.” And it’s God-given, so who would think that is a problem? Any strength a child possesses can be his greatest weakness when he uses that strength to replace a craving that his parents exacerbated by their lack of love for each other. Musical ability, social competence, physical beauty, affluence, video gaming, and intelligence (academics) are just a few of the other traps our children fall into as they distance themselves from familial chaos. Children are born broken because of the sin of Adam (Romans 5:12). A parent’s job is to cooperate with the Lord in bringing the child to Christ, the only person who can fix the brokenness (Colossians 1:28). Christ’s job is to fix all of us. But if parents get in the way of their children by their sinful attitudes, words, and actions toward each other, it is doubly hard for their children to get to Restorer of Lives. Even worse, are the parents who “get in the way” while claiming to be Christians. A bad marriage in a Christian home is worse than lousy parenting in a non-Christian home. A child from a non-Christian home may look to Jesus as an answer. A child from a chaotic Christian home may deduce that Jesus has no solution because He could not fix his parents. The “do as I say and not as I do” home will stir-up nearly insurmountable anger and hostility in the heart of the child. If the parents are not producing an authentic representation of who Christ is in their marriage, the chances of the child spewing Christ out of the mouth is high. Because of this issue in some marriages, I tell these parents to stop parenting and start working on their marriages. If you try to lead a child to Christ when you are not practically following Christ in your marriage, your mission will implode, and your child could very well reject you and your Savior. Few things are more distasteful to children than a hypocrite. When the hypocrites come in twos, it is doubly hard to swallow. Whatever it is you want your child to become, you must be a reliable and authentic witness of that thing or your efforts to parent well will backfire. I realize what I am saying is common sense. But the truth is that some couples have so much embedded hostility, unforgiveness, hurt, and anger toward each other that they overlook this truth while doubling down on getting their children to follow Jesus. And they never fix their marriage (1 Corinthians 11:1). They would instead go against the odds than lay down their arms and work on their marriage. Their bitterness is too strong, and their self-righteousness is too high. If the children of couples like this ever fall in love with Jesus, it will be in spite of the parents rather than because of their parents. A biblical marriage creates in the heart of a child a desire to follow the Lord. An unbiblical marriage creates in the heart of a child a desire to follow anything but the Lord. Though the Lord will save anyone regardless of their life circumstance, it is wrong and evil to stand in the way of others who need Jesus (Matthew 19:14). I suspect some parents could read these things and think they are the cause of their children rejecting the Lord because they had an awful marriage. Other parents could read this and believe their children will follow Jesus because they have a good marriage. Both perspectives are wrong. Good parents with great marriages do not make Christians, and neither do bad parents with lousy marriages. A Christian is made a Christian because of the gospel, and the gospel comes to us because of unearned favor (grace) (Ephesians 2:8-9). Do not fall into the trap of, “What have I done to my children?” With that said, it is imperative for you to give biblical reflection regarding, “What have I done to my children,” especially if your marriage is not a good reflection of Christ and His church (Ephesians 5:25). Two ditches exist here, and you do not want to fall into either one of them. The self-righteous soul will think their works matter. The arrogant soul will presume on the grace of God. Our works matter, not in an ultimate salvific sense, but in a practical emulating sense. No parent should hinder a child from getting to Jesus. A parent’s job is to be a humble conduit that shows the child the way to the Christ through their attitudes, words, and actions. Is your marriage hindering your children from loving Jesus? What are some of the attitudes or actions in your marriage that do not put Christ on display in your home? What about your affection for your spouse? Do your children perceive a genuine warmth between you and your spouse? Think about your marriage this way. When you first reconnect with an old friend that you have not seen in a long time, the embrace is warm, complete, rich, and deeply felt. Anyone observing your reunion would sense the genuine affection that you have for each other. Parents in a biblical marriage should show a sense of deep affection for each other. A couple should have genuine love for each other. If that is not present in your one-flesh union, that is where you need to begin the process of parenting your children. I suspect that in most broken marriages, the spouses are not able to have a mature discussion about the real issues. The hurt is too deep. If that is you, the most effective place for you to begin the reconciliation process is with the Lord, rather than with each other. In Matthew 18:33, the master said to the wicked servant, “And should not you have had mercy on your fellow servant, as I had mercy on you?” He was asking a cost comparison question. The wicked servant was beating up a person who owed him far less than what he owed his master. The wicked servant owed 10,000 talents to his master versus a hundred denarii that were owed to the wicked servant. The question you must wrestle with first is, who is the greater debtor? Your sin against God will put you in an eternal hell, but He forgave you all that debt (Romans 5:8). 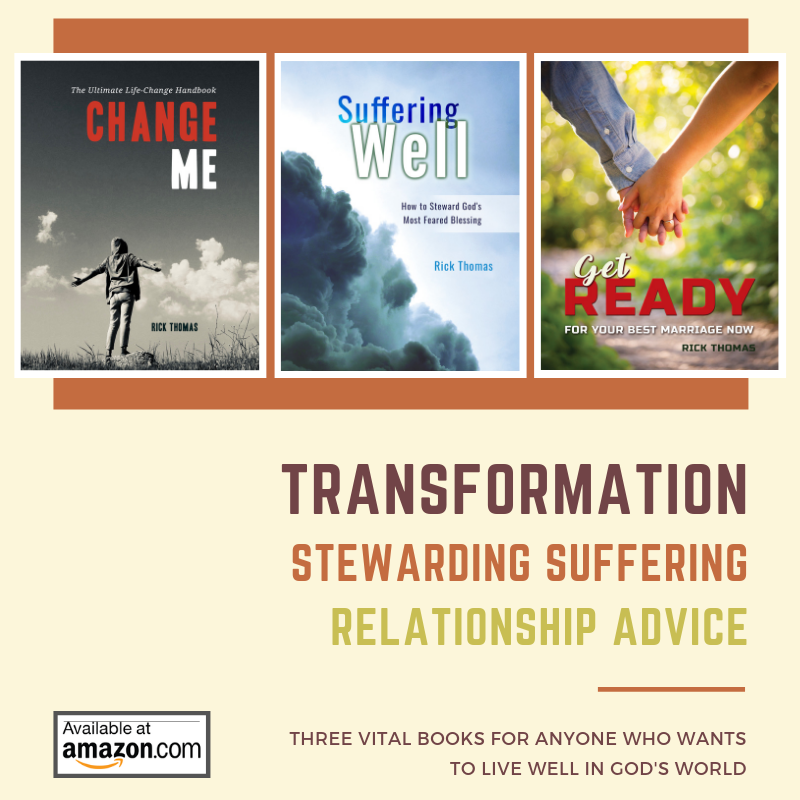 Until that singular truth transforms your thoughts, you will never be able to forgive–either transactionally or attitudinally–your spouse for whatever wrongs that are between you two. Perhaps your spouse will not want to reconcile. It happens. You may never be able to transact forgiveness between the two of you, but that is not the first place for you to begin. If you have unforgiveness, bitterness, or anger toward your spouse, the first place for you to go is vertically to your Father so you can experience release from the prison that your sin has placed you. You see this in Joseph’s attitude toward his brothers. Long before he transacted forgiveness horizontally with them, he had already reconciled their sin against him in his heart by going vertical with His heavenly Father. His soul was free from them before he reconciled with them. How is your attitude toward your spouse? If a “needle” represented your attitude on a “cold to hot meter,” where does your needle typically point when you think about your spouse? How do you need to change? Will you begin today, even if your spouse will not?